Now you can rejet your carburetor on the fly, right from your dash. 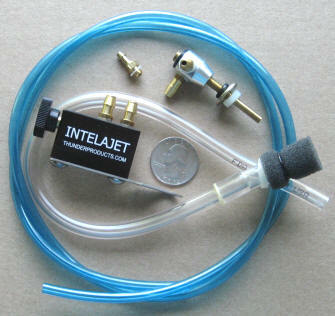 IntelAJet isIntelajet fuel system, ATV, Motorcycle, snowmobile, go-cart, jr. dragster, Yamaha, Polaris, Suzuki, Kawasaki, Arctic Cat, KTM, Keihin, Mikuni, Carburetor, high performance, adjustable, jet, kit, altitude, temperature, jetting the latest high-tech version of the time proven Dial-A-Jet system (since 1972). Not familiar with a Dial-A-Jet? It is like a power jet, but it has an air bleed so instead of feeding raw fuel like a power jet, the Dial-A-Jet (and IntelAJet) meters the air and mixes it with the fuel in a chamber, delivering a pre-atomized fuel mixture into the center of the carb throat. The fine pre-atomized spray can’t displace the heavier (poorly) atomized fuel from the other carb circuits, so it fills in the lean areas. This gives you a consistent fuel flow pattern and basically fills the gaps in your carb’s fuel overall fuel delivery. 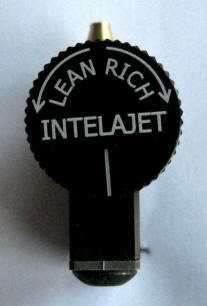 Now with the latest IntelAJet, we get an even broader range of fuel delivery from lean to rich and infinite adjustment. And here’s the key difference; IntelAJet lets you control the fuel flow from the riding position, right on the dash in front of you and easy to access. Fuel flow adjustments are instant – rotate the black knob on the metering module, wjih is clearly marked right for richer and left for leaner., It is machined from billet aluminum, laser engraved and anodized for great looks and corrosion protection. It is a sealed unit except for the air inlet point, which is supplied with a “snorkel kit” that filters the incoming air. 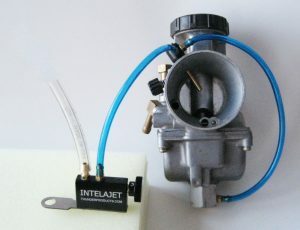 Intelajet fuel system, ATV, Motorcycle, snowmobile, go-cart, jr. dragster, Yamaha, Polaris, Suzuki, Kawasaki, Arctic Cat, KTM, Keihin, Mikuni, Carburetor, high performance, adjustable, jet, kit, altitude, temperature, jetting. The carburetor module is also machined from billet aluminum, not plastic. It’s small and lightweight and can fit most every installation. It is a completely sealed unit so you won’t be feeding mud, water, dirt, dust, sand or debris into the carbs. So, if the temps change or you’re going up and down in elevation, you can give it a twist and keep your sled running great all the time, instead of only when it is cold out (or at the base of the hill). Now every carbed sled can have adjustable fuel delivery, on the fly. The IntelAJet is also great for single carb machines lide ATVs and dirt bikes. A single cylinder kit goes for $199.95, with the twin cylinder kit going for $249.95. The IntelAJet comes from Thunder Products, manufacturer of the tunable Thunder Shift Kit clutching products and numerous carb accessories, including the Dial-A-Jet and IntelAJet air-corrected adjustable jetting systems. Check them out at www.thunderproducts.com or call 320-597-2700. Next post: Your Airbox, Friend or Foe?